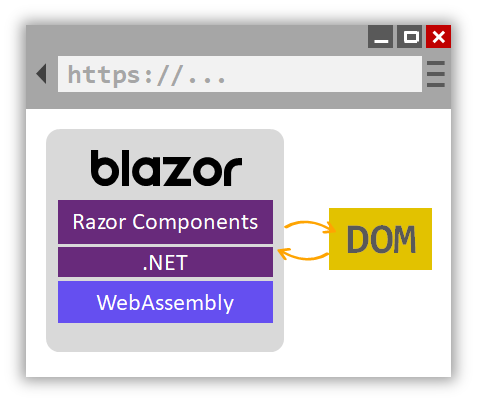 Home Resource What is Blazor and what is Razor Components? I’ve blogged a little about Blazor, showing examples like Compiling C# to WASM with Mono and Blazor then Debugging .NET Source with Remote Debugging in Chrome DevTools as well as very early on asking questions like .NET and WebAssembly – Is this the future of the front-end? Let’s back up and level-set. The .NET code runs inside the context of WebAssembly. You’re running “a .NET” inside your browser on the client-side with no plugins, no Silverlight, Java, Flash, just open web standards. Here’s a great diagram from the Blazor docs. Here’s where it could get a little confusing. Blazor is the client-side hosting model for Razor Components. I can write Razor Components. I can host them on the server or host them on the client with Blazor. You may have written Razor in the past in .cshtml files, or more recently in .razor files. You can create and share components using Razor – which is a mix of standard C# and standard HTML, and you can host these Razor Components on either the client or the server. 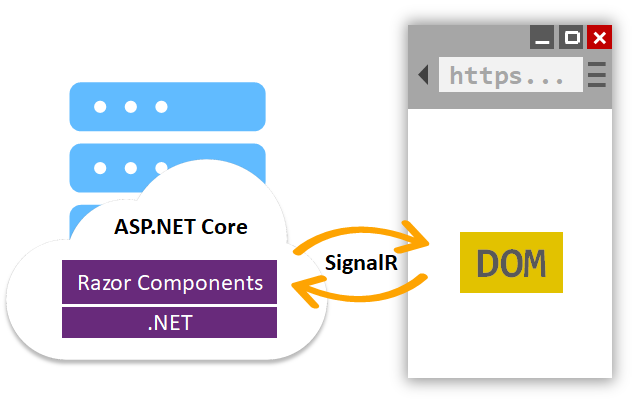 In this diagram from the docs you can see that the Razor Components are running on the Server and SignalR (over Web Sockets, etc) is remoting them and updating the DOM on the client. 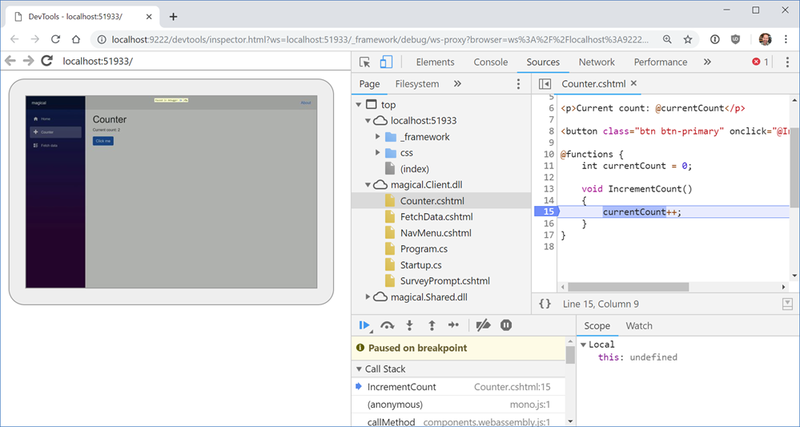 This doesn’t require Web Assembly on the client, the .NET code runs in the .NET Core CLR (Common Language Runtime) and has full compatibility – you can do anything you’d like as you are not longer limited by the browser’s sandbox. Here’s the canonical “click a button update some HTML” example. You can see this running entirely in the browser, with the C# .NET code running on the client side. .NET DLLs (assemblies) are downloaded and executed by the CLR that’s been compiled into WASM and running entirely in the context of the browser. Note also that I’m stopped at a BREAKPOINT in C# code, except the code is running in the browser and mapped back into JS/WASM world. It’s a pretty exciting time on the open web. There’s a lot of great work happening in this space and I’m very interesting to see how frameworks like Razor Components/Blazor and Phoenix LiveView change (or don’t) how we write apps for the web.